Innovize is committed to continuous quality improvement, in the management of our own operations and in the projects and processes deployed for our clients. We listen to requirements, deliver on commitments and seek to streamline processes by eliminating non-value-added steps. In 2011, the FDA launched their Case for Quality. They saw that just being compliant to the Quality System Regulations (QSR) did not make companies produce better products. The FDA worked with Medical Alley to create a new public-private partnership so the FDA could work directly with industry. The Medical Device Innovation Consortium was formed in 2012. The MDIC had five original projects and one was the Case for Quality (CfQ). 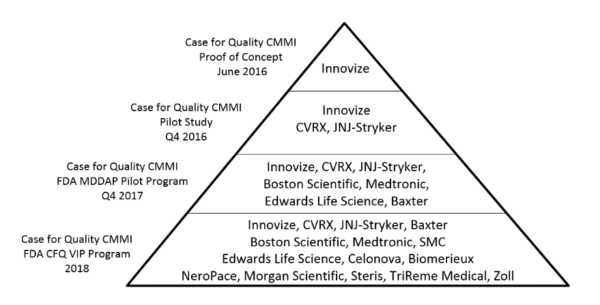 In the CfQ, there were multiple sub-projects, but the development a Medical Device company maturity model assessment was the pillar of the project. In 2015, Innovize’s VP of Quality (Mark Rutkiewicz) joined the small team to implement the maturity model assessment concept. The CfQ project had chosen the CMMI Institute’s model that was developed out of Carnegie-Mellon University-Software Engineering Institute for defense contractors. 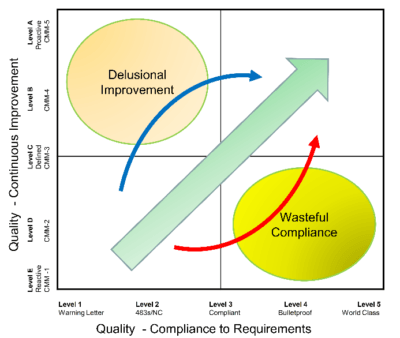 The model is called the Capability Maturity Model Integration (CMMI). With Mark’s 30 years of experience building and rebuilding Quality Systems in all size medical device companies, Mark took on the leadership of the Maturity Model implementation sub team. The first challenge was to get the FDA to agree the CMMI assessment would work, so Mark volunteered Innovize to be the Proof of Concept. Innovize had just passed an FDA QSIT inspection in January of 2016 with no findings. This is a pre-requisite for the CMMI assessment. In June of 2015, this two-day assessment was done at Innovize with the FDA watching the entire interaction over a video feed. The FDA was pleased with the process and it was agreed that a larger pilot was needed. Innovize took the lead again; in October of 2016, Innovize was one of three companies to participate in the larger five-day assessment. Coincidentally, Innovize had implemented a new ERP system between the two assessments. The results of the second assessment showed the ERP implementation had improved Innovize’s maturity score. In August of 2017, the FDA formally launched an industry-wide pilot program. Innovize was the first company to sign up. Innovize had their first full assessment to CMMI Level 2 under the program in December 2017 and a second assessment to CMMI Level 3 in December of 2018.